Gov. 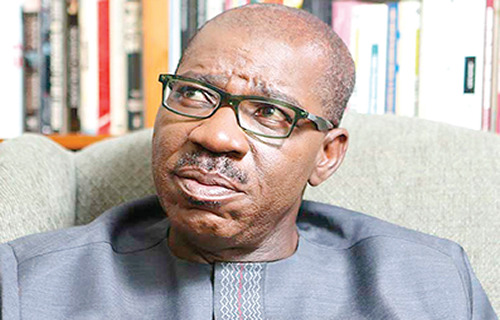 Godwin Obaseki of Edo has decried the nonchalant attitude of many Nigerians at road traffic accident scenes, describing it as `worrisome’. Speaking in Abuja on Tuesday, Obaseki called for more public enlightenment on the need for members of the public to take action to save lives whenever they witnessed accidents. The governor spoke at the commencement of activities to mark the 2017 African Union Road Safety Day/ World Day of Remembrance for Victims of Road Traffic Crashes. “When road crashes occur, prompt response of various relevant agencies should be required to rescue and evacuate the victims for optimal medical care. “But there is a trend we are observing: I ran into a road crash, very fatal one, a couple of months ago. “Rather than people rushing to aid victims, you had people standing by and using their cell phones to record those crashes. “I found that worrisome and it is something we the agencies should take on and encourage and educate people that we must be first responders. “When we arrive at accident scenes, the first thing we should do is to go out there and try to assist, not to make it incident for entertainment,’’ he said. Obaseki, who was the Special Guest of Honour at the occasion, also called for the setting up of response centres and healthcare facilities at strategic points on accident-prone highways across the country. He said the Edo State Government was already taking steps in collaboration with the private sector in that regard. “The other issue which I think has not been properly articulated is that there are corridors on the roads, like the Abuja-Kaduna corridor, we found is one of the roads most prone to accident. “In Edo, we have the Okene-Auchi-Ehor-Benin (road). “We should be able to map and ensure that we have enough response centres like trauma centres and hospitals in these axes because crashes are bound to happen, and we should be able to respond fairly rapidly to save lives when they occur,’’ the governor said. Obaseki promised to use his position as member of the Nigeria Governors Forum to encourage his colleagues to adopt measures that would strengthen road safety in the country. The Corps Marshal of the Federal Road Safety Corps (FRSC), Dr Boboye Oyeyemi, said the African Union Road Safety Day/World Day of Remembrance was an annual event designed to raise public awareness on road safety issues.